Rob Shelley will be cycling for Prostate Cancer UK in SeptemberUK based Shelley Signs director, Rob Shelley, is getting on his bike to promote awareness of prostate cancer – the most common cancer in men. Every year; 40,000 men are diagnosed with the disease and Prostate Cancer UK is a charity that fights to help more men survive it and enjoy a better quality of life. 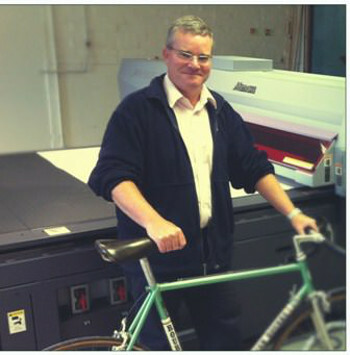 Rob owns Market Drayton based sign maker, Shelley Signs and later this month will be taking to the hills around Malmesbury in Wiltshire to ride 25 miles with four friends, in support of Ian Webster, who was recently diagnosed with the disease. Hybrid Services (exclusive UK & Ireland distributors for Mimaki) is pleased to support their efforts - wishing them a following wind and a safe and pleasant ride!